Whether you're on the lookout for New York fine dining establishments or cute little cafes in NYC, we've provided you with a comprehensive guide to dining in New York. View our extensive New York dining guide, so you'll know all the best lunch and dinner spots before paying a visit to the great state. 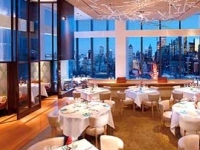 Browse through our extensive list of New York restaurants, and find one that best fits your liking. We've researched thousands of restaurants throughout NY to put together a comprehensive new york restaurant guide, mapping out some of the finest eateries in the state.